Long noncoding RNAs (lncRNAs) have various biological functions and have been extensively studied in recent years. However, the identification and characterization of bovine lncRNAs in skeletal muscle has been very limited compared with that of lncRNAs in other model organisms. 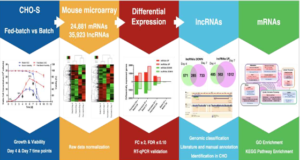 In this study, researchers from Tianjin Agricultural University identified 7188 bovine skeletal muscle lncRNAs in four different muscle tissues by RNA-Seq and a stringent screening procedure. 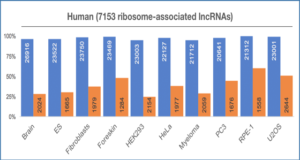 These lncRNAs shared many characteristics with other mammalian lncRNAs, such as a shorter open reading frame and lower expression level than for mRNAs. 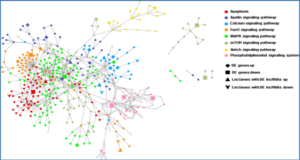 Furthermore, the chromosomal locations and global expression patterns for these lncRNAs are also described in detail. 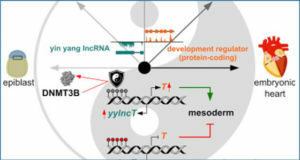 More importantly, the researchers detected the important interaction relationships of lncRNAs-miRNAs-mRNAs related to muscle development among 36 lncRNAs, 62 miRNAs and 12 mRNAs. These results provide a global expression pattern of lncRNAs specific to bovine skeletal muscle and provide important targets for revealing the function of bovine muscle development by thoroughly studying the interaction relationships of lncRNAs-miRNAs-mRNAs. 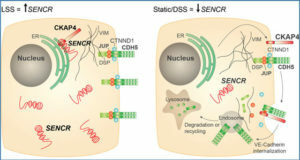 (a) Schematic diagram of pipeline for the identification of lncRNAs. (b) Venn diagram showing the co-expression lncRNAs across four kinds skeletal muscle tissues. 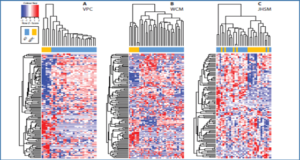 The overlapping expression profiles of lncRNAs depicted in different colours across four tissues are: longissimus thoraci (blue), scapula muscle (green), intercostal muscle (yellow), gluteus (red). (c) Categories of the lncRNAs. (d) Distribution of the open reading frame (ORF) lengths of the lncRNAs. (e) Distribution of the ORF lengths for the protein-coding genes.